Experiencing a fall is a major concern for adults over the age of 65 and 35% of over 65’s will experience at least one fall in a year. This figure rises to over 50% for the over 80 age group. If you are worried that you are at risk of falling, or you have a friend or family member who is at risk, speak to your GP, pharmacist, or care worker if you have one for further help and advice. Or take a look at our leaflet which has some top tips for reducing your risk of falling and a set of simple exercises you can do at home to help yourself stay active, stay steady. 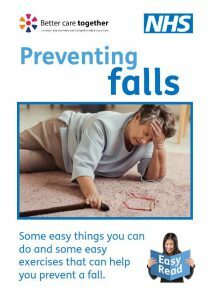 You can also download an easy read version of the leaflet and our posters, one highlights the top tips to reduce the risk of a fall and the other has information and contact details if you need advice on making a referral to the falls service. For more information about Steady Steps, the free, 24-week postural stability exercise programme for people aged 65 and over who are at risk of falling or who have previously fallen visit Leicester-Shire & Rutland Sport (LRS). Pre-booking is required for all Steady Steps courses, so please contact your local course coordinator to check availability in your area. Leicestershire – visit First Contact Plus for information or to make a referral. 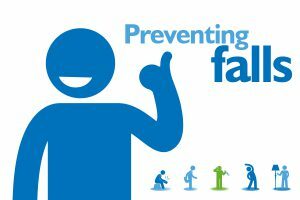 Click here for more useful links on staying well and active or to return to the main Falls Prevention page click here. Here are some top tips to help prevent falls. Eat healthily and regularly and always take your medicines on time and as prescribed.